Thanks to the employees at Meetings and Incentives Worldwide Inc., TLC received a generous donation. We appreciate your thoughtfulness and dedicaton to helping those we serve. Shorewest Realtors, Burlington office, staff was allowed to wear casual clothes if they made a $2.00 donation. This money then was collected for the shelter. Yesterday, the brought in a check for $1576.00! 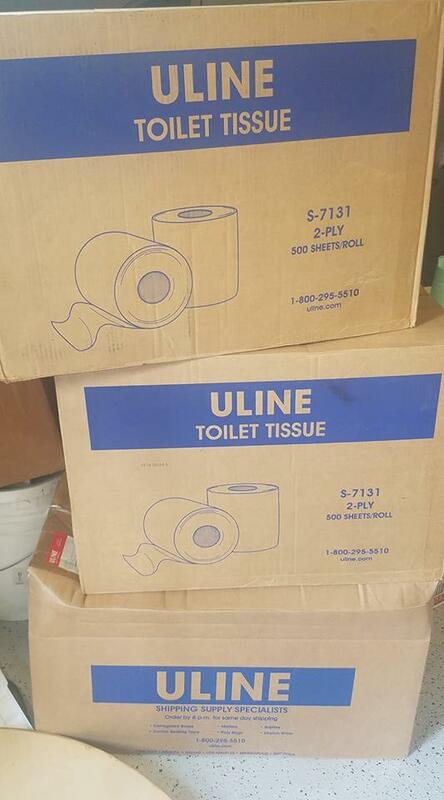 Thanks Uline for the much needed shelter supplies. We have a full house and these cleaning supplies will definitely be useful when doing chores. For the majority of people who donate to TLC they will never be fortunate to meet someone who has been part of the shelter program or learn their story. This is not true for Grace Ciardo. For she was blessed this year with having two little boys ,who had been part of the TLC family, become her cousins through adoption. This month Grace turned 13! As most teenagers can't wait to make their list of wants Grace made a list of shelter needs. She chose to forego getting birthday presents and instead asked her six friends to make a donation to TLC. It was a pleasure meeting Grace and her mom today and letting them know what an impact the donations will have on the families served. We were even able to get two of the littles to smile when taking a picture with Grace. Thanks again Grace and enjoy your teenage years! TLC staff would like to thank some of the employers who have hired the women at the shelter helping them to move towards self-sufficiency. Thank you for helping these families get back into being part of the community. The donations just keep coming in. Thanks to the Canella Reponse Television staff and members of the community we recieved additional cleaning supplies and paper products for the shelter. When sheltering 20 women and children each day these supplies help to provide what is needed to run the household and save TLC in expenses, making it possible to put financial donations where needed most- into programming and client support. With organization from Jill Stobber, Waterford High School Athletic Director, the high school staff participated in an extra "jean" day, prompting a donation to TLC. 44 teachers participated and raised $460 and in addition the Athletic Department matched that amount. Furthermore, Jill and Ellen Blair, special education teacher, made a donation to make the total amount raised $1380. This money will go towards continuing to meet the needs of the women and children at the shelter. We couldn't be more grateful to have teachers supporting the families we serve for the social workers at TLC often rely on them to work together to assist the children living at the shelter. Thank you Waterford High School staff for the donation and for recognizing the need in our community. Thanks to the Burlington High School classes of 1987, 1988, and 1989 TLC recieved a donation from their fall reunion. We hope they enjoyed their night together reminiscing about old times and getting caught up with what is happening in everyone's lives now. 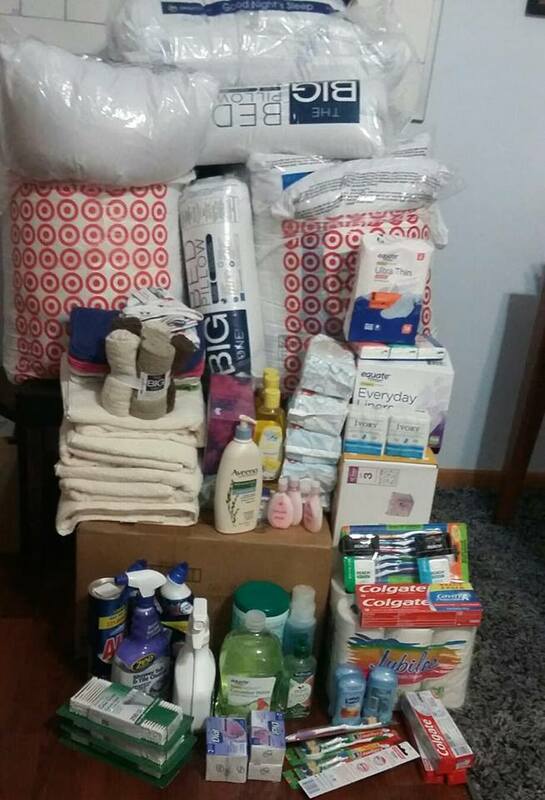 We appreciate you thinking of the families we serve and making this donation! Especially thanks to Kelly McNamara, Julie Verhagen, and Ann Covelli for organizing this event. Everyone needs insurance in their life, to protect their home, car, personal belongings and loved ones. We are thankful that Mangold Insurance is dedicated to donating to the shelter to help us take care of and "protect" the families we serve. On behalf of the women and children living at the shelter - We Say Thank You! Thanks to Ellen Blair Stobber and her family the shelter recieved additional items needed for the women and children. These items allow the families to have their basic needs met, while working towards making life long changes. As the holidays approach, TLC staff and the families served are constantly reminded of the outpouring of support from the community. Receiving these donations was no exception to that. Thanks again Ellen and the Bills family! Thanks to Aurora Health Care Surgical Services TLC received needed shelter supplies. Thank you Lori Traber and all the nurses who gave to this holiday drive. We truly appreciate it. Community State bank employees were each given $100 at the start of the holiday season, however, the catch was that they needed to choose a local organization to donate it to. Marilyn Sorenson knew that TLC is were she wanted to give her money and through spreading awareness about the program she was able to get 11 other people to donate their money to TLC as well. We are grateful for this $1200 donation and for the acknowledgment of our program. A group of 10 Waterford students, made up of sophomores and juniors, were headed to a sportsmanship summit in Stevens Point when they were rerouted home due to weather up north. In an effort to still discuss components of sportsmanship, the students made a day of giving back to TLC, realizing that as athletes they could truly make a difference in those around them. From conversations they had while shopping to meeting the kids they impacted directly, the student-athletes discovered that a lot of what happens in the sporting arena impacts what happens in everyday life. The athletes took this away from their experience- Control what you can control, be kind to others, and know everyone has a story. And know when you give to others you realize the impact you had on them and that forever changes your story. Thank student athletes for being a part of the TLC story. Also, thank you Jill Stobber for your dedication to these athletes and future leaders! 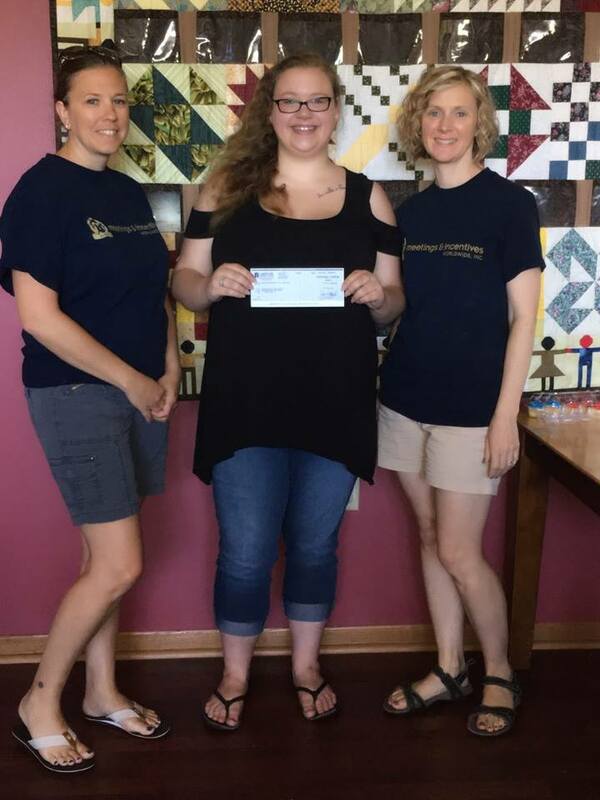 TLC received a $5000 grant from the Burlington Community Fund to help support the installation of security system at the shelter. Thank you for acknowledging our program and helping us keep the families and staff members safe. TLC past Board Member Patricia Hoffman recently celebrated her 70th birthday at the Liar's Club. The party was a gathering of her friends and family and a way to celebrate her special day. In turn TLC became the recipient of the guest's generosity and Pat's commitment to TLC. Our families will benefit greatly from these generous gifts. This year we received a grant for client support from the Green Bay Packer Foundation. They presented 213 organizations from 44 different counties over $800,000 in grant money. It was a very inspirational event seeing the impact that the Packers have on this great state and those in need. So if you ever needed another reason to turn your tv on on a Sunday afternoon to watch a Packer game- this could be it. TLC was granted $20,000 from Racine Community Foundation. This funding will be used to support case management services for the 2017-2018 fiscal year. Case managers are an integral part of the shelter program and to the participant's success. TLC received $3000 from the Keefe Kares Foundation. The Keefe Kares mission is to identify local community needs and match them with time, talent and financial contributions for a great impact. We are grateful that the TLC program was found worth of funding. Thank you Troop 303 for making dinner for the families at the shelter. Charlie, Jon and Andy did a great job making the lasagna. It was delicious. We appreciate Troop Leaders Jeff Schopp and Tim Bartelson for choosing TLC for your volunteer efforts. When you are kind to others, it not only changes you, it changes the world." Thank you Leah Zinnen, Jenna Hotvedt, and Halie Behnke for cooking a delicious meal for those living at the shelter this past holiday season. Also, the gifts to the children and their moms was very thoughtful. It is these times that we are reminded how amazing today's youth can be, taking time out of their busy lives to share with others. The parents, teachers, and school district should be very proud of these young women. TLC received a $25,000 grant for the 2016-2017 fiscal year from the Runzheimer Foundation. This grant will be used for client support and case management. Their continued support is greatly appreciated. TLC is appreciates the support from Kwik Trip. They were awarded a $1000 grant to help towards the 2017 transportation program. This will allow case mangers to continue to take clients to appointments, work, school, and meetings. All things necessary to help them become self-sufficient. TLC is fortunate to have receive United Way funding for the 2017-2018 fiscal year. This allows TLC to continue its work with the homeless families of Western Racine County and assist in making the program more efficient and effective for those served. Life teen held its annual Cold Hands Warm Heart event in October. This annual event is where area teenagers camp outside overnight in boxes to simulate a homeless experience. The group brought raised $19500 for TLC and heard personal stories of those living and working at the shelter. What a great experience for all! Lastly, we appreciate Ellie Schultz for choosing TLC to receive these donations. We love to see the students learning about helping those in need while growing in their faith.